Browse: Home / 2016 / March / 13 / You never promised me a rain garden? You never promised me a rain garden? We installed two rain gardens in our front yard in 2010. There is the beautiful “sunny” garden and the fern dominated “shady” garden. Both are a tremendous enhancement to our front yard and the neighborhood. We live on a busy, downsloping street. Whenever it rains heavily, the swale along the street in our front yard fills with rushing water and it ends up in the small wetland just to the north of us. At the Mahtomedi RITE of Spring Earth Day event in 2009, I talked to the local garden club about the possibility of a rain garden to intercept this runoff. Rain gardens were starting to become a best management practice to deal with the many problems associated with urban runoff. I was then told to contact the Washington [County] Conservation District. This is where the project took off. They said our house was in the Rice Creek Watershed District and that they would contribute up to $2,500, or 50 percent, of the project cost. However, the runoff from our lot had to go to one of the bodies of water in their district. So, on a dark and stormy day, with the storm sirens going off, two guys from the WCC and the RCWD chased our runoff thru the local marsh and determined that it would eventually end up in Bald Eagle Lake, or within their district. At this point the WCC actually designed the rain gardens and selected the appropriate plantings. They then provided us with a list of local landscaping companies that did this type of work. We selected St. Croix Landscaping, from Osceola, Wisconsin. They dug up the front yard, made sure the slopes were right to intercept the runoff and installed the plantings. To secure the monies from Rice Creek Watershed District, we had to enter in to a five year agreement with the District to maintain the rain gardens, or they would ask for their 50 percent back. What a bargain! The plantings chosen attract a plethora of pollinators. All summer we have honey bees, bumble bees, and butterflies. Tree frogs even like to hang out here. The gardens are a joy to work in, also giving us some exercise. We both look forward to a bit of time with the flowers, pulling weeds and moving things around. It’s now our favorite part of the yard. Last year for our daughter’s wedding, the photographer was so impressed that she staged all the family photos in front of the rain garden. After a couple years, many of the plantings were getting too large and we had to split them. We have enlarged other gardens around the house, thus making more plants for the pollinators, more beauty and more exercise for us. Our road is a common walking path. Most everyone that comes by says “Wow, your gardens are beautiful”. It then gives us the opportunity to say thanks, and say that they are actually rain gardens, partially paid for by Rice Creek Watershed District. So we can spread the good news, if you will. 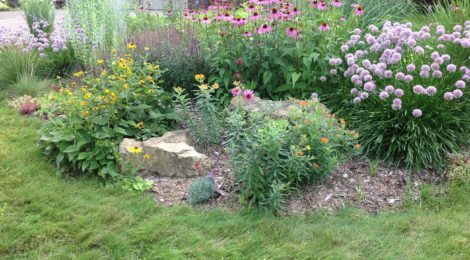 If you are considering a rain garden, give us a call, we would “bee” most happy to give you a tour.